When you run a business, there’s nothing worse than a missed opportunity. And when an unexpected event—whether it’s natural or man-made—disrupts your business, every minute can feel like a missed opportunity. To avoid such issues, it’s essential that you have a business continuity plan in place. A business continuity plan will help you limit downtime and loss in the event of a disruption, while boosting customer and employee confidence, lessening business risks and reducing potential financial losses. Follow these five steps to help create your business continuity plan and keep your business on track, even during the toughest of times. Identify your threats, including natural hazards that might affect the location of your business. Rank the probability of those threats, then rank the severity of each. Multiply the probability and severity to create scores for each and address the highest scores first. What is your main product/service? What are the things that could most likely impact your ability to do business? Which of your business functions and processes have legal, contractual, regulatory or financial obligations? Would you know how to reach your employees? Do you have current home and mobile telephone numbers, addresses, emails and emergency contact information? Do you have current contact information for key suppliers, vendors and business administrators? Is all this information available offsite from your business location? No matter the size or scope of your business, it’s nearly a certainty that you rely on computer hardware, software and digital data. Having access to these tools and information is crucial to your ability to stay in business. Keep backup copies of everything on or accessed by your computer including operating systems, critical software, files, logins and passwords. Store one backup copy onsite and another in a safe at an offsite location that will still be available in the event of a large-scale disaster. Before an event, shut down and unplug all your computer hardware. Consider elevating or moving equipment offsite. Whether it’s having the correct insurance or an emergency cash fund on hand, preparing your finances in advance of a disaster is critical to keeping you in operation during a disruption. A well-stocked emergency cash supply can help you buy supplies or crucial equipment during a disaster. Identify all financial obligations and expenses that must be paid. Work with your independent insurance agent to determine the best coverage for your business. To help you get started, Grange Insurance and the Insurance Institute for Business & Home Safety (IBHS) are happy to offer the following resources to help you develop a business continuity plan that fits your needs. For help creating your own business continuity plan, download the OFB-EZ toolkit below. Need more information on planning for severe weather events? Download the EZ-PREP toolkit below. IBHS’s simple-to-use business continuity program that focuses on recovering from disruptions to stay open for business. Is a storm heading your way? Check out IBHS’s severe weather planning guide and customizable checklist. Please contact a local independent Grange agent for complete details on insurance for your business, including coverages and discounts. 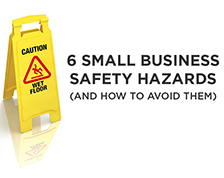 Do you know the safety hazards inside your small business? Take a look at our list of six common small business safety risks and start protecting your business, yourself, and most importantly, your employees.